John’s Note: During the spring when the weather and the water heat-up, the crappie move into the shallows near the bank to spawn. But oftentimes a late winter cold front can drive the crappie from the banks to open water. Also in many sections of the U.S., the water’s still cold or cool in mid-March to the end of March. 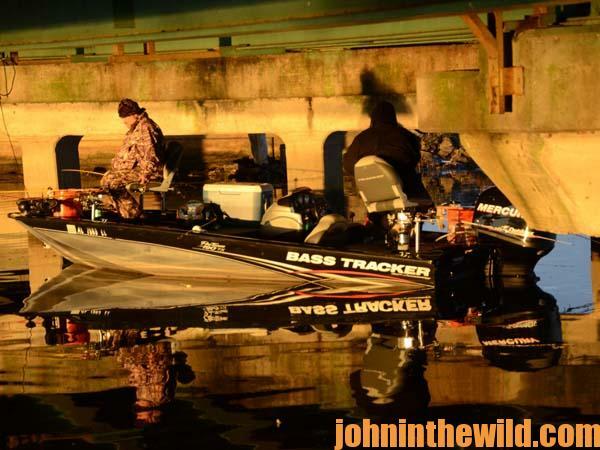 As I investigated how to find deep-water crappie not on the banks in the spring and at other times of the year, I learned that the most-consistent place to catch crappie at any time of the year is away from the bank. One of the key considerations for consistently finding crappie is locating vertical structure that permits the crappie to move up and down in the water, regardless of the water temperature or the time of year. The structure also must attract baitfish. For this reason, bridge pilings on the edges of creek and river channels are productive places to find crappie year-round. Besides providing the vertical structure that crappie prefer, bridge pilings also break the current and attract baitfish the crappie can eat. 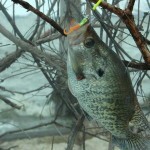 At different times in the day and the night and under various water and weather conditions, crappie will position themselves at several depths along the pilings. 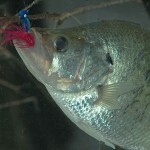 Depending on the time of year and the crappie’s seasonal migration pattern at that time of year, the crappie fisherman may find the papermouths either on the piling closest to the river or the creek channel or the pilings closer to the bank. 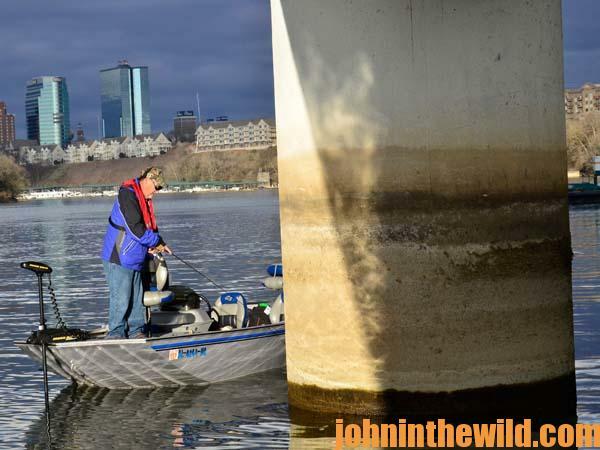 However, at almost any time of year, bridge pilings provide habitat for crappie and a good place for the crappie fisherman to look for the crappie. During the fall and the winter, the concrete of the bridge pilings absorbs heat and transmits that heat into the water. Often there will be a 1or a 2-degree temperature change close to that piling. In cold weather, that degree or two of warmer water may be just what the crappie are searching for and may provide a hot spot for crappie fishermen. 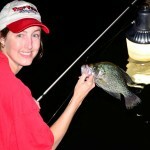 Another crappie hot spot may be standing timber. When a reservoir is flooded, besides roadbeds and bridges, many times standing timber will be left in the lake. This standing timber may be on the edges of creek and river channels. 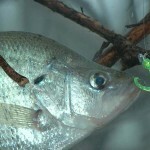 When this situation occurs, the crappie often will suspend in this timber, particularly during the hot and the cold weather. Actually crappie may be on this type of structure at almost any time of the year, because this is where baitfish will hold. 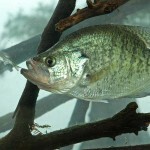 Also, crappie have vertical structure to relate to there, and the standing trees provide a current break. When you find the crappie in the timber, knowing at exactly what water depth the crappie are holding is critical to catching them. Many times the crappie will be holding in 12 to 15 feet of water beside the standing timber with a bottom at 40 to 50 feet. 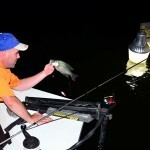 The depth finder becomes critical to locating crappie in this deep water. Once you find the crappie, lowering either minnows or jigs to the crappie at the precise depth that the crappie are holding is the difference in catching and not taking crappie. There are several ways to measure the length of line on either your rod or your pole to ensure your bait is at about the right depth to fish. If the crappie are holding in 12 feet of water, and you’re fishing with a 6-foot rod, lower your bait down to where it touches the end of the handle of the rod. Next, with your fingers, pinch the end of the line at the tip of the rod. You’ve measured exactly 12 feet. Pointing your rod, so that the tip nearly touches the water means your bait will be in the proper depth to catch crappie. When the crappie are holding in the treetops, finding the crappie on the depth finder and keeping the bait at the right depth for the crappie to see and eat it is important to catching these deep-water crappie. 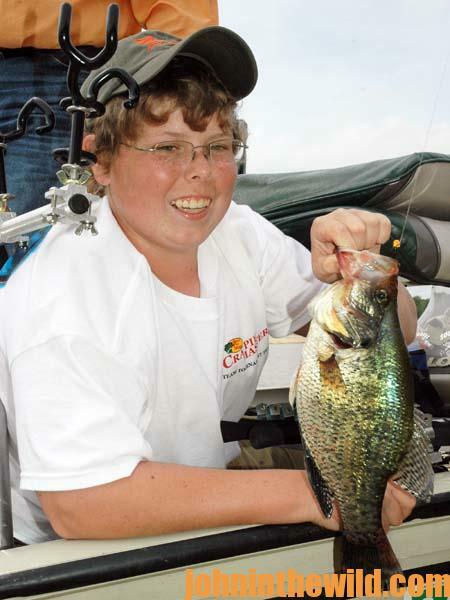 To learn much more about crappie fishing, get John E. Phillips’ Kindle eBooks and some print books, “Crappie: How to Catch Them Fall & Winter,” “Crappie: How to Catch Them Spring and Summer” and “Catch Cold Water Crappie Now.” Click here to get these books.